Father Hilary Meny, the longest serving priest in the history of the Archdiocese of Indianapolis, died on Oct. 7 at his home in Haubstadt, Ind., where he had been cared for by his extended family for many years. He was 101, and had been a priest for 76 years. The Mass of Christian Burial was celebrated on Oct. 12 at SS. Peter and Paul Church in Haubstadt, which is in the Evansville Diocese. Cardinal-designate Joseph W. Tobin, archbishop of Indianapolis, was the principal celebrant of the Mass. Father Anthony Ernst, pastor of SS. Peter and Paul Parish, was the homilist. Burial followed in the parish cemetery. 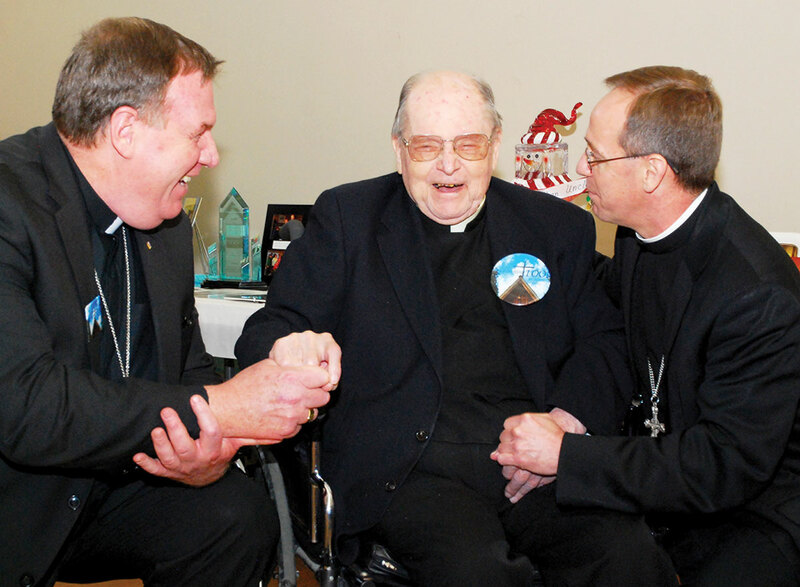 After Father Meny’s death, Cardinal-designate Tobin praised him for his many years of faithful priestly life and ministry. Beginning his priestly formation as a seminarian shortly before the Stock Market Crash of 1929 that ushered in the Great Depression, Father Meny served in active ministry in the archdiocese for 50 years before retiring in 1990 at 75. For 41 of those years, he ministered as the pastor of the former St. Patrick Parish in Madison. He was also instrumental in the founding of the city’s Father Michael Shawe Memorial High School and Pope John XXIII School. 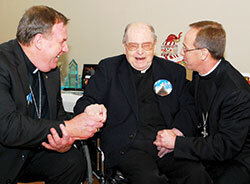 In a 2010 interview with The Criterion, Father Meny gave a simple explanation for his decades of service in the southern Indiana city along the Ohio River. His love for the people whom he shepherded for so long also led him to plant roots in Madison. One of the many people that he served over his 41 years in Madison was Father Christopher Craig, pastor of Prince of Peace Parish there, who graduated from Shawe in 1983. When he and more than 20 people from Prince of Peace Parish visited Father Meny last year on his 100th birthday, Father Craig was amazed at how well he remembered all of his visitors. But he knew it flowed from his closeness to the people of Madison in his many decades there. Carol Lorton, a member of Prince of Peace Parish, had Father Meny as a teacher and as a member of Shawe’s first graduating class in 1956. She also knew him later as she raised her family in Madison. In seeing St. Patrick Parish as his family, Father Meny was willing to do many household tasks, including painting and re-wiring St. Patrick Church. His dedicated care for the Catholic community in Madison continued into his retirement, including financial contributions to a new student band established a few years ago at Shawe. When they participated in a contest in Evansville, they paid Father Meny a visit afterward. SS. Peter and Paul Parish there, appreciated the continued witness of Father Meny’s devotion to the priesthood during the last years of his life. Hilary G. Meny was born on Jan. 21, 1915, in Haubstadt to Bernard and Catherine (Emmert) Meny. St. Meinrad where he was a seminarian for 11 years. He was ordained a priest on May 14, 1940, by Bishop Joseph E. Ritter at the Archabbey Church of Our Lady of Einsiedeln in St. Meinrad, and celebrated his first Mass at SS. Peter and Paul Church in Haubstadt on May 19, 1940. Father Meny’s first pastoral assignment was as assistant pastor of St. Philip Neri Parish in Indianapolis, where he served until 1947. He then ministered for one year as assistant pastor of the former St. Joseph Parish in Clark County. In 1948, he was assigned as assistant pastor of St. Vincent de Paul Parish in Bedford, where he served for one year. In 1949, Father Meny became pastor of the former St. Patrick Parish in Madison and remained its shepherd until his retirement in 1990. During his life, he was honored in various ways by Father Michael Shawe Memorial High School in Madison, which he helped to establish, including having the school’s gymnasium named after him. In 1998, the Archdiocese of Indianapolis honored his service to Catholic education with a Career Achievement Award at the annual Celebrating Catholic School Values gala. Surviving are many nieces and nephews and their extended families. Among his caregivers were his nieces Maureen Ruggles, Laurette Faraone, Rachelle Gore, Celeste Karcher, Carmen Jay and nephew Greg Kissel.